Entirely handmade, colors and decorations may vary from one model to another according to inspiration and creativity of the artisan. The skirt goes to the calves but it can also be wear at the knees. It is therefore possible to easily adjust to desired length using scissors. The cords located at the belt allow an easy adjustment for the hip. 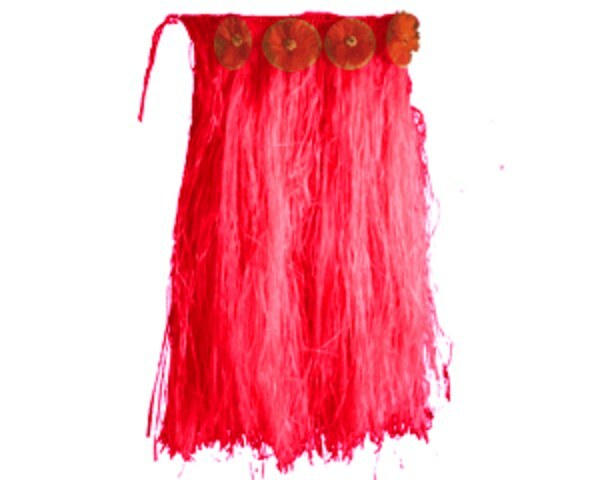 The colour of the skirt is always in Red color, but you can choose the color of the ornaments at the belt : natural fiber, red, orange or mixed. Please indicate the color in your order form on comment. Width: about 1 meter - Available on order only : around 48 to 72 hours manufacturing time.